There are plenty of e liquids out there today more then ever before. With the growing popularity of vaping. More and more companies are throwing their hats into the ring. But like everything else in life. Not all are created equal. there are those who look at business and life as anything worth doing is worth doing right. And then there are those who believe. The almighty dollar is always the bottom line. So just to be fair please understand I’m not in business for the love of it. I do like to eat and put a roof over my families head. They are sort of spoiled that way. But I also like to get my monies worth when I shop and expect you do also. quality and service for a good price. Sounds easy enough. But is it ? Lets see! I buy the best ingredients for my Premium liquid because I want to sell the best. And hopefully my bottom line will be success. So I do. Then I see some guy on E bay selling 120 ml bottles of what he’s calling Premium e liquid for around $5.50 a bottle with free shipping? Have you mailed a letter lately? A stamp for a letter is like .49 cents then how about the envelope is that free? Uh you cant ship a 120 ml bottle in a envelope anyway. Not that size. First you need a 120ml bottle. Then you need a childproof tamper resistant cap. Then you need extract, VG & PG and how about Nicotine ? Then you need to package it properly. We use bubble wrap. Tape it in a pouch. Then put it in a plastic bag. Just in case it gets stepped on by the shipper and leaks. Then it goes in a small cardboard box. And then it gets labeled and then put into a bag or box for shipping and then fragile stickers are put on it. Now I’m not a detective but if someone can sell premium e juice for that price and make money. He’s either a genius or selling premium crap!!! I know what it cost. We don’t make our E liquid in a garage. Its made in a lab. We buy the finest USA Pharmacopoeia grade and kosher grade VG/PG Available in the USA . Our staff consist of trained professionals including a bio chemist. Did you ever hear the expression. If it sounds to good to be true it probably isn’t? Well that’s not us. We are professionals and make quality Premium E liquid for a very fair price. We don’t want to fool you!! Our customers know us and have been with us for many years. Because we sell great tasting Premium E liquid made with the finest ingredients that money can buy. And we sell it at a very fair price. There is a difference between E liquids and Premium E liquids. And we sell Premium E liquids at Liquid Coast _ E liquids. Try a bottle today. We have Hundreds of flavors to choose from and we can make it in any PG/VG or Nicotine level you like. Check our website out at www.eliquidcoast.com and you will be glad you did. Until then. 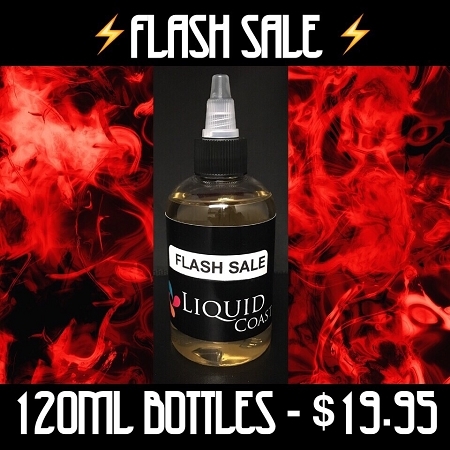 We do occasionally have Flash sales where we sell 120ml bottles for $19.95 and that's almost a break even price. we do it because we want you to get value for your money and get to try a real Premium E liquid without paying a premium price. Just our way of saying Thank you!